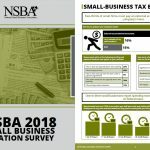 Washington, D.C. – The National Small Business Association (NSBA) today released its 2018 Small Business Taxation Survey which shows administrative burden continues to far outpace financial burdens, and unfortunately, there doesn’t seem to be a light at the end of the tunnel: complexity is expected to increase for tax year 2018. The survey also asked several questions about the Tax Cuts and Jobs Act, and how the recently-passed tax reform law will impact small business. According to the survey, one-in-three small businesses report spending more than 40 hours each year on federal taxes, and the majority spend more than $1,000 each year on the administration alone of federal taxes. Payroll taxes and income taxes were ranked the top two most burdensome taxes for small businesses. Among those small businesses that collect sales taxes, one-in-three report spending one full work week and more each year on sales tax. More than half of small firms with five or more employees pay an outside firm to prepare their payroll.